Through a series of close readings at all three levels of the text—the author’s statements, the frame narrative, and the stories themselves—Sherberg shows how Boccaccio exposes and explores gender tensions rooted in a notion of the patriarchal household, which finds its own rationale in the natural-law postulate of the inferiority of women. 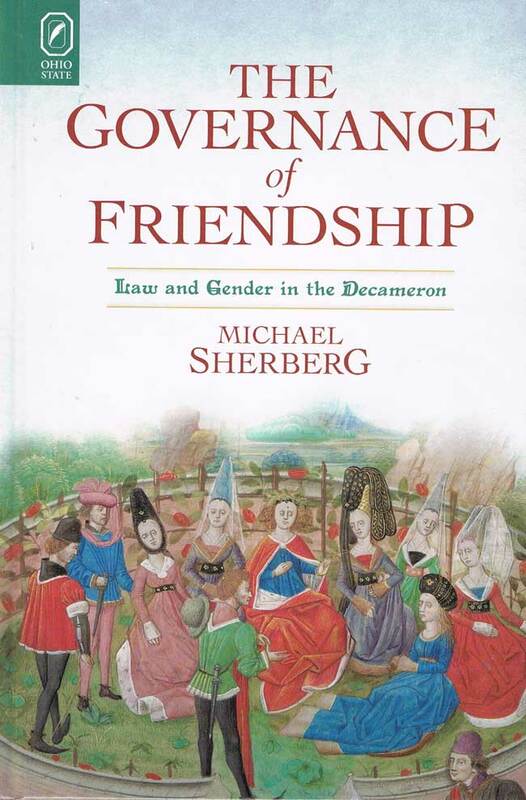 Relying on the writings of the great twentieth-century legal theorist Hans Kelsen, Sherberg demonstrates how through the complex architecture of the Decameron Boccaccio dismantles the logic of natural law, exposing it instead as a rhetoric used by men to justify their control of women. The Governance of Friendship aims well to advance our understanding of Boccaccio as an intellectual: not only steeped in the key texts of his time, but also at the forefront of critical thinking about such issues as law and gender which will play out over the coming centuries and beyond. Michael Sherberg is associate professor of Italian, Washington University in St. Louis.